Truckee Meadows Parks Foundation is leading free walks in different Washoe County parks from April 4 through September 26, 2019. All walks are on Thursday evenings and are half a mile to about 1.5 miles. Each week, you can explore a new location and learn about the unique and varied ecology and history of parks in our area. Plan on spending a bit over an hour on each hike. Walks are open to everyone. Winter is a great time to enjoy family fun at Galena Creek Visitor Center and the surrounding park, and we’re certainly having an epic winter. Here are some things going on during March, 2019. Guided Hikes – Saturdays, 10 a.m. to 12 noon. Join a naturalist along one of the Galena Park trails and learn about the area. If there is snow, these hikes will be on snowshoes. Forest Dwelling Bats – Saturday, March 2, 10 a.m. Come and learn from the bat aficionado, Kellie Carter, which species prefer to live among the trees. Surviving the Wilderness – Sunday, March 3, 10 a.m. Come learn the fascinating realities of surviving in the wilderness – as well as the adventures, with former mountaineer and current long-distance hiker Peter Tremayne. Hawks of Northern Nevada – Saturday, March 9, 10 a.m. Join long-time Lahontan Audubon Society member Alan Gubanich for a workshop on how to identify these species. Bring your field guides and let’s talk hawks. Virginia City-Mining on the Comstock – Saturday, March 16, 10 a.m. Come hear Garrett Barmore, the Curator of UNR’s Keck Museum, talk about this fascinating topic that has shaped northwestern Nevada. Lake Tahoe and the Comstock Mines – Saturday, March 23, 10 a.m. Lake Tahoe still struggles with this destructive 19th century legacy, but better management practices have brought the region back from the brink of devastating exploitation. Scary or NOT! – Sunday, March 24, 10 a.m. Come and learn from Fish and Wildlife Biologist, Michelle Hunt, about some of the plants and animals that might give you a scare out here in Nevada. Odonata Odyssey: Nevada’s Dragonfly and Damselfly Diversity – Saturday, March 30, 10 a.m. Join Marianne Denton, Environmental Scientist and Aquatic Ecologist, for this fascinating presentation. Orion the Hunter – Saturday, March 30, 8 p.m. Join the Astronomical Society of Nevada as they take us on an exploration of the Orion Constellation. Please call to confirm attendance – weather must cooperate! (775) 849-4948. A suggested donation of $5 for each activity is requested to help pay for programs. Galena Creek Visitor Center is at 18250 Mount Rose Highway in south Reno. For more information, call (775) 849-4948. Source: Galena Creek Visitor Center Newsletter. 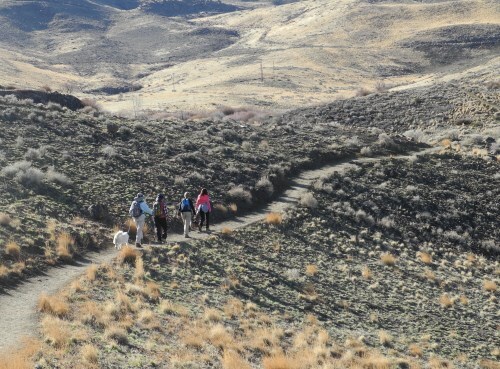 The Truckee Meadows Trails Challenge (TMTC) motivates participants to get out and explore many of the hiking trails and public parks around the Reno area. At the same time, you will be supporting our parks through the Truckee Meadows Parks Foundation. TMTC is a self-guided program where you choose the trails you want to hike and the challenge level – basic, moderate, and advanced – after signing up. You can pick basic trails or go for it with up to 100 miles of trails. You consider your own interests and fitness level in making your selections. If you would like a little motivation, there are guided hikes available each month at different locations. Individuals, families, and groups can all take the challenge. As you complete your hikes, enter them in your trail log book. You have a year from the time you sign up to finish your challenge. Once you have completed all of your trails, submit your log to TMTC and you will receive your “I Survived the Truckee Meadows Trails Challenge” t-shirt.